Here is a concert that will take the audience to many places, emotionally and intellectually. The Island Consort, directed by Bruce Farquharson, has expanded to 21 singers – and, with that, is singing some very rich arrangements for up to 8 parts and for double choir. This program includes some early music but presents a significant portion of late 20th C and 21st C material. 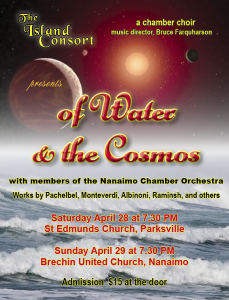 On the program are works by Pachelbel and Rheinberger for double choir, 8-part renditions of Albinoni’s “Adagio” and Paul Mealor’s “Locus Iste”, and 4 pieces relating to First Nations culture. 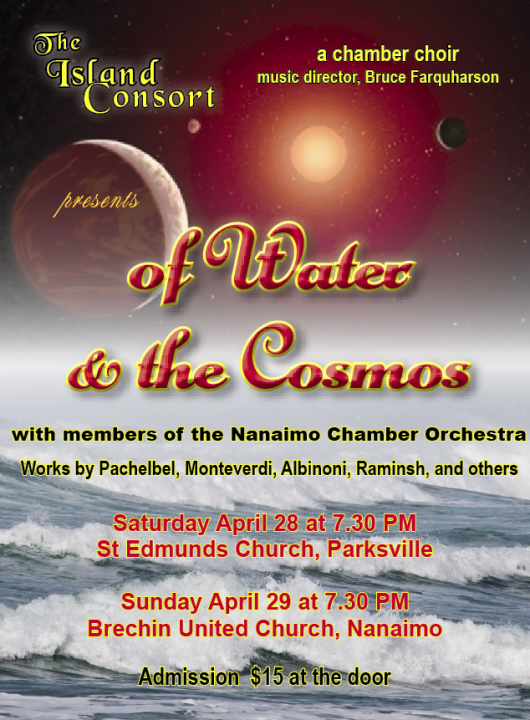 Players from the Nanaimo Chamber Orchestra will accompany the choir on 3 works; Monteverdi’s “Beatus Vir”, Albinoni’s “Adagio” and Raminsh’s “The Great Sea”. Water presents the finishing touch with 3 pieces; Full Fathom Five, Sea Fever and Deep River. Admission is at the door.